English chart-topper Florence Welch is all about her pipes and pantsuits in 2015. Hitting the festival circuit to promote her highly anticipated third album ‘How Big, How Blue, How Beautiful’, Florence has traded in her textured mix of crushed velvet and floor-sweeping pleats for 70s inspired masculine suits. Renowned for her unwavering vocal power and bohemian flair, this red-haired beauty has revamped her signature style and undoubtedly cemented her seat in fashion’s front row. A nod to both modern androgyny and nostalgic power dressing, Florence has adventurously turned a style corner with her commanding pantsuits. ‘Dog Days Are Over’? More like dress days are over. 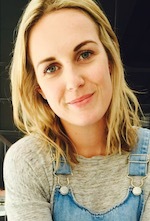 Elise Cullen is an Australian contributor for theFashionSpot and lives in Sydney. She is a latte-sippin’ digital producer and freelance writer with a penchant for both pop culture and stripes.